The invention of the _____ and the _____ by the Arabs and Chinese made European exploration possible. Europeans studied works of _____ and _____ to earn geography of the known world. _____ started the slave trade in the Americas. 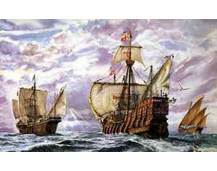 Mercantilism was the reason that Europeans first set up posts and colonies in _____. The _____ paid peasants to produce products. Natural law applied to everyone and could be _____. During the Enlightenment, Thomas Hobbes and John Locke based their ideas about government on _____. Separation of powers means that governmental power is divided among the executive, judicial and _____ branches. One English writer who was a strong supporter of women's rights was _____. France's Sun King, or _____, was the most famous absolute monarch in history. This ruler was one of Russia's most powerful czars.